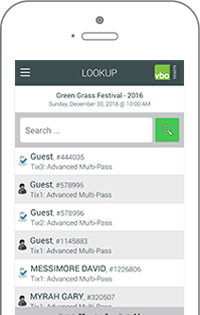 With Virtual Box Office’s mobile app, event producers are just a touch away from real-time statistics, guest lists as well as check-in and check-out functionality. VBO Touch is the ideal mobile companion for a promoter. 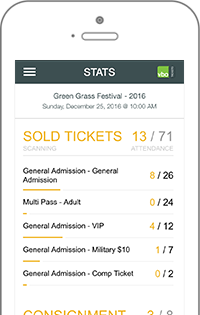 It includes event selections, statistics, guest list and scan options, Ticket and Merchandise sales and a settings screen for online/offline scanning, print options and support contact info. 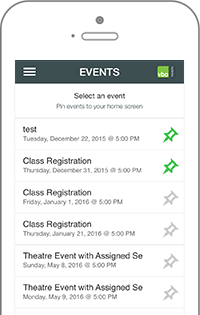 For convenient access, the home screen lists all 'pinned' events. You can pin and un-pin events in the events list view. All upcoming events are listed under the Events tab. 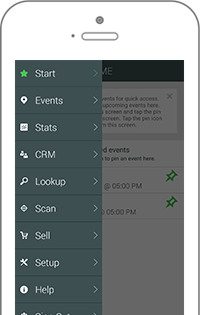 You can click on an event to activate it or you can pin/unpin events to the Home Screen. This allows you to get quick access to the events you care about. On the road or away from your computer? No problem. 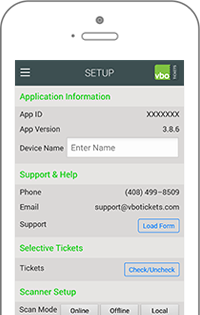 With the VBO Touch app you get access to all basic event statistics. For assigned seating events we also added a patron detail view allowing you to see sales and donor history by simply clicking on the seat in a seat map view! The Guestlist screen will list all patrons for events with 750 patrons or less and you may scroll through the list and check-in / check-out patrons by clicking on their names. For events with more patrons you will use the Filter options to search by name and / or order details. Matched results will display and you can continue with the check-in / check-out options. 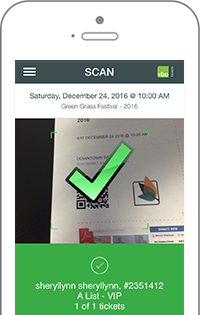 Scan your patrons and merchandise vouchers in realtime via wi-fi or 4G network -OR- use offline scan mode and then batch upload the scanner info to our cloud based servers for later reporting. Either options will prevent duplications and fraud for your events. Our scanners support 2D QR barcodes and 1D line barcodes. For a more robust high volume scan solution ask us about VBO Scan Servers which use industrial type Opticon Scanners connected to a local scan server. 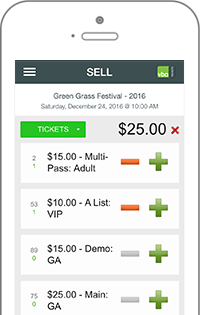 Sell tickets, merchandise and collect donations by cash, check or credit card. We also support PayPal Here for easier checkout for all PayPal clients. The PayPal here supports Card.io credit card scanning that eliminates the need to have a credit card swiper and uses the camera of your tablet to read the credit card info. Payments will be sent securily to your bank account instantly and customer can sign, receive a confirmation via email or text message. Current settings allow you to manage light behaviour, online/offline scan mode, bluethooth printing and patron photo upload option.